This page is dedicated to the enduring contributions of Dr. Yun Peng Huang and his colleagues, notably Dr. Hitoshi Fukusawa, Dr. Tatsuhiko Ohta, and Dr. Toshio Okudera. 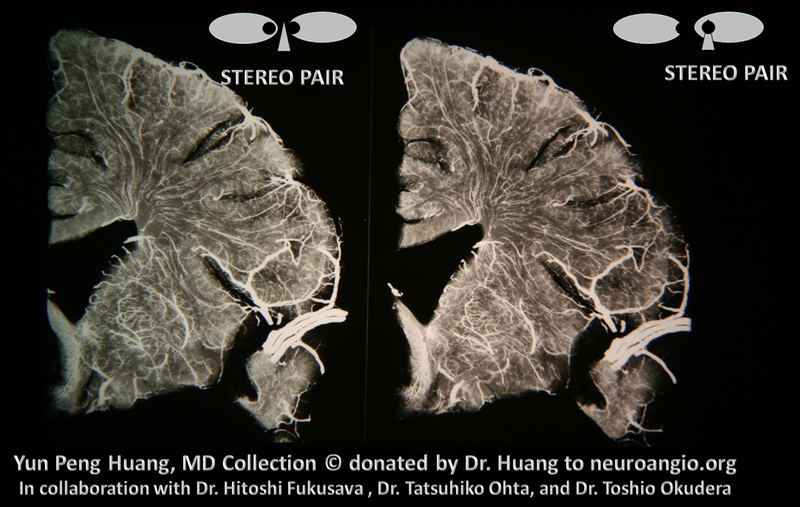 Dr. Huang’s seminal work in early cerebral angiography, particularly his contributions to understanding of the venous system, laid the foundation of subsequent worldwide investigations. Meticulous work, utilizing adult and embryo specimens, was carried out to define the various components of the superficial and deep venous systems, their evolution and inter-connection. 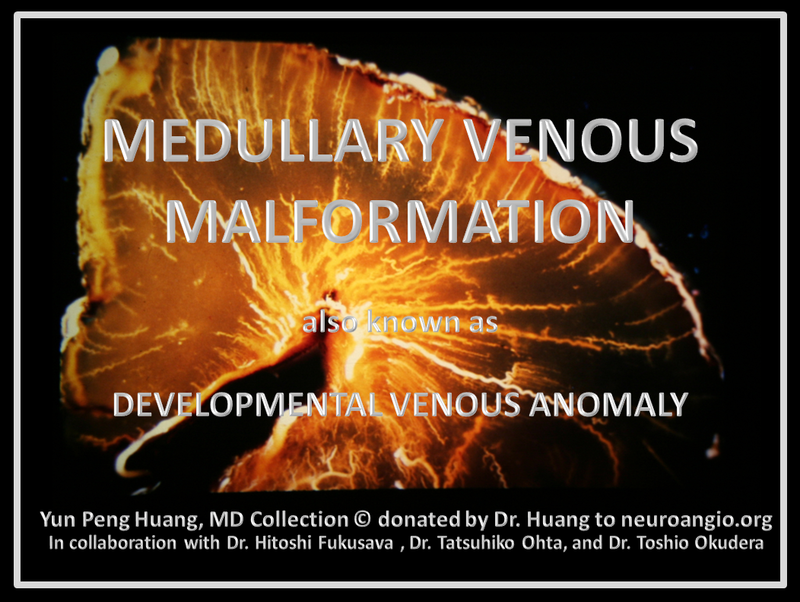 In particular, this work advanced our understanding of what is now known as a “Developmental Venous Anomaly” or DVA, — termed by Dr. Huang and colleagues as the “Medullary Venous Malformation” (the acronym DVA was advanced by Pierre Lasjaunias, Patricia Burrows, and Chantal Planet in their widely sited publication). Previously, this essentially nonpathologic entity was periodically subjected to resection or other intervention, usually with negative consequences. Other key contributions of Dr. Huang include the first comprehensive treatise on the angiography of posterior fossa veins — which I believe still remains the single best and definitive work today — and is a must read for all neurointerventional trainees (Dr. Huang’s chapter and Rhoton’s posterior fossa venous work are both foundation and superstructure of essential posterior fossa gross venous anatomical knowledge). Extensive use was made of stereo projections, at technique which uses fusion of two angiographic images to produce a composite with three-dimensional information — a technique which continues to be extremely useful in the era of rotational angiography and is heavily emphasized in this website. 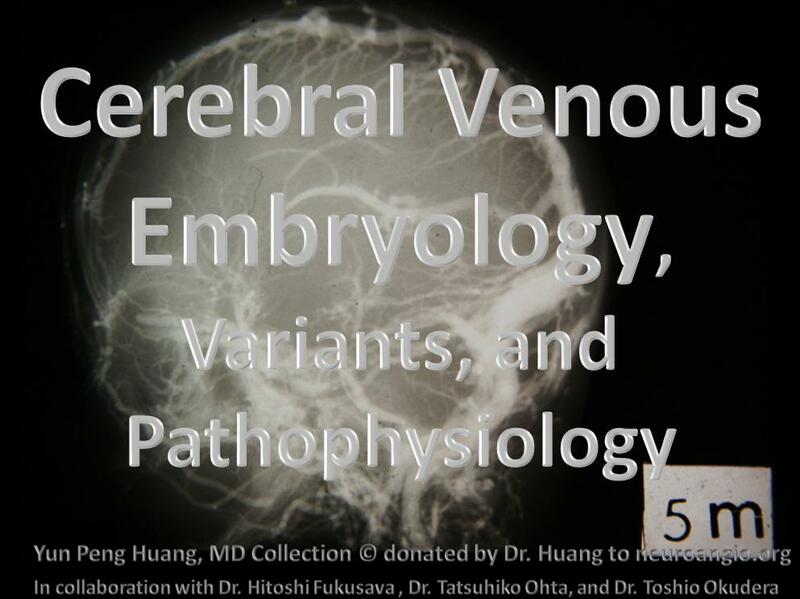 Other important contributions by Dr. Huang and his colleagues are embryo dissections and injections — the only consistent effort I am aware of to study neurovascular embryology after Dorcas Hager Padget and George Linius Streeter. Dr. Huang spent most of his career at Mt. Sinai in New York City, where he participated in mentorship of many radiologists, neurosurgeons, and early neurointerventionalists. Following his retirement, his extensive 35 mm slide collection was moved to his home, and remained there until his generous donation of its major portions to neuroangio.org With full permission of, and strong encouragement by Dr. Huang, a review and digitization of the slides was undertaken by Drs. Maksim Shapiro and Eytan Raz of neuroangio.org The following slides are now made available to the medical community, as open access, to promote the common vision of excellence in neurodiagnostic and neurointerventional education, shared by Dr. Yun Peng Huang, his colleagues, and neuroangio.org Although copyright is attached to the slides, permission for reproduction is hereby granted with stipulation that credit be given in form of “Yung Peng Huang collection, www.neuroangio.org, used with permission” Credit is given to the major contributors, however it is likely that others who should be named have not been recognized, due to generational gaps. neuroangio.org sincerely regrets in advance any such omission and is happy to consider correcting any errors one brought to attention. The following sections are pictorial essays of Dr. Huang’s work, subdivided by major topics. Slides are reproduced with minimum digital alteration. In additional to valuable anatomical information, many slides also stand out for their sheer artistic beauty, which we are proud to make available to the digital world. All comments and questions can be submitted here.